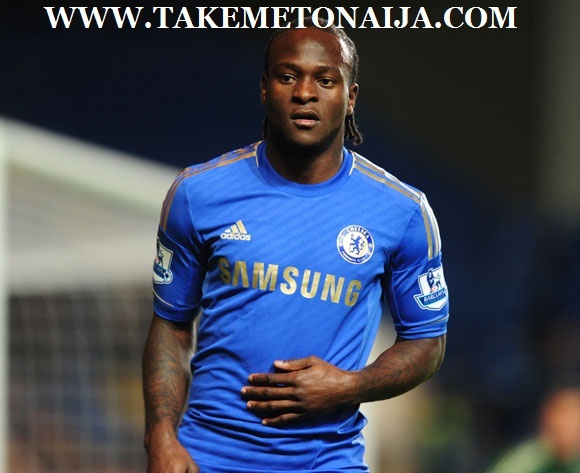 Victor Moses is a Nigerian professional footballer who plays for Premier League club Chelsea. He plays as a winger. campaign at the 2013 Africa Cup of Nations, as well as the 2014 FIFA World Cup. Moses was born in Lagos, Nigeria, the son of a pastor. When he was 11, his parents were killed. A week later with his travel being paid for by relatives, Moses came to Britain as an asylum seeker. He attended Stanley Technical High School (now known as the Harris Academy) in South Norwood. Scouted playing football in the local Tandridge League for Cosmos 90 FC, Crystal Palace approached him, with the club’s Selhurst Park stadium just streets away from his school. Offered a place in the Eagles’ academy, Palace recommended him to the fee-paying Whitgift School in Croydon, where former Arsenal and Chelsea star Colin Pates was coaching the school football team. Moses first came to prominence at 14 after scoring 50 goals for Palace’s under-14s side. Playing for three years at both Whitgift and Palace, Moses scored over 100 goals as well as helping Whitgift win many School Cups, including a National Cup where Moses scored all five goals in the final against Healing School of Grimsby at the Walkers Stadium, Leicester. When he was 11 years old, he learned that after an attack at his home, both of his parents were killed. At that time, Victor was playing football at the streets, where he learned the tragic news. Apart from the shock, he was notified that he was to be the next target, so his friends smuggled him to a hiding place in order to calm the situation. Somewhere in there, he found the solution: to emigrate and seek for asylum in England. A family from South London accepted the responsibility to take care of him. At age of 11, Moses arrived in England, in a place completely unknown to him, away from his home, in a place that he knew absolutely no one. “That trip from Nigeria was too big. What I want, is to stay strong and work hard for myself whether this has to do with football or not. We should thank God for what I am today. It’s a dream come true and if i continue at the same rhythm, who knows, i may play for Barcelona one day.” says Victor Moses. The memories of those childhood years when he played football with the rest of his pals on the streets of any Nigerian city are still fresh. “I wore no shoes. We simply barefooted and when a small ball fell at our feet and we started out playing football.” remembers Moses, who already counts three matches with the National Nigerian team, hoping to help get the qualification to the African Nations Cup after the recent 2-2 in the first match against Liberia. “When I was in Nigeria last week, everyone were supporting Chelsea. Was very nice to see Chelsea fans in Nigeria and shouting my name. The same thing happened when I went to Liberia. Everywhere in Africa, all football fans are watching Premier League.” he said. He score twice in 32 appearances in 2008–09 as Palace had a disappointing campaign finishing in 15th position. In 2009–10 Moses went on a run of six goals in eight matches but Palace were suffering huge financial problems and the club went into administration in January 2010. On the final day of it he completed a £2.5 million transfer to Premier League side Wigan Athletic after Palace went into administration. He made his debut on 6 February 2010 as a substitute against Sunderland in a 1–1 draw. On 20 March 2010, Moses came on as a substitute against Burnley and got his first assist for the club, setting up team mate Hugo Rodallega for an injury time winner. He scored his first goal for Wigan on 3 May 2010 against Hull City. Following the departure of Charles N’Zogbia, Moses became a regular starter for Wigan in the 2011–12 season. On 10 December 2011, he scored his first goal of the season against West Bromwich Albion – his first goal since scoring against the same team last season. On 23 August 2012, Wigan Athletic accepted a fifth bid from Chelsea after they finally met Wigan’s asking price after four previously unsuccessful bids. The player was given permission to speak with Chelsea. On 24 August, Chelsea announced that the transfer of Moses had been completed. Moses played his first game for Chelsea when he appeared as a substitute against West London rivals Queens Park Rangers on 15 September. Moses made his full debut for Chelsea when he started the League Cup game against Wolverhampton Wanderers and scored his first goal after 71 minutes in a game that finished 6–0 to the Blues. Moses started his first Champions League game against Nordsjælland. On 31 October, Moses was named Man of the Match of the match against Manchester United in the League Cup, a game Chelsea won 5–4. On 3 November 2012, Moses scored his first Premier League goal for Chelsea in the match against Swansea City, which ended in a 1–1 draw. Four days later, he scored his first Champions League goal for Chelsea against Shakhtar Donetsk; Moses replaced Oscar in the 79th minute and went on to head in Juan Mata’s corner with seconds left to secure a 3–2 win. On 5 January 2013, Moses opened his scoring tally for the year with a powerful drive into the bottom corner whilst playing in the FA Cup Third Round against Southampton, as Chelsea came from 1–0 behind to beat the Saints 5–1. and then his second in the reverse fixture a week later. He continued his fine form in the competition by scoring his side’s first goal in the 1–2 away win at FC Basel on 25 April. He also scored in the reverse match against Basel when the Blues won 3–1 at home and secured their participation in the Europa League Final, a match in which Moses did not feature but the Blues nonetheless won 2–1 against Benfica in Amsterdam on 15 May. On 2 September 2013, Moses signed for Liverpool on a season-long loan deal. He scored on his debut on 16 September against Swansea City in a 2–2 draw. On 25 January 2014, he scored the first goal of a 2–0 victory against Bournemouth in the fourth round of the FA Cup. Due to the form of Raheem Sterling during the 2013–14 season, Moses found opportunities hard to come by under Brendan Rogers playing 22 games of which only nine were starts. On 16 August 2014 Moses joined Stoke City on loan for the 2014–15 season. He made his Premier League debut for Stoke City on 30 August 2014 in a 1–0 win away at Manchester City. In Stoke City’s 1–0 win over Newcastle United on 29 September 2014, Moses provided the assist for the lone goal scored by Peter Crouch and was voted Man of the match for his performance. On 19 October 2014 in a 2–1 win against Swansea City, Moses won a penalty after going down under a challenge from Àngel Rangel and after the match Swansea manager Garry Monk claimed that Moses dived. Match of the Day 2 pundit John Hartson also claimed Moses had cheated but he later apologised to Moses for his comments. He scored his first goal for Stoke on 1 November 2014 in a 2–2 draw with West Ham United. Moses suffered a thigh injury against Burnley on 22 November 2014 which ruled him out for eight weeks. On 17 January 2015, Moses returned to the starting line-up against Leicester City which ended in a 1–0 win for Stoke. On 21 February 2015 Moses scored a 90th-minute penalty to earn Stoke a 2–1 victory over Midlands rivals Aston Villa at Villa Park. He also scored in a 2–0 victory over Everton on 4 March 2015. With André Schürrle and Mohamed Salah leaving on a permanent basis and on loan respectively, it was announced that Jose Mourinho attempted to recall Moses back from Stoke City, only for the winger to reject the move back. Moses suffered a hamstring injury whilst playing against West Ham United on 11 April 2015, which ruled him out for the rest of the season. After a successful season on loan with Stoke City, Moses returned to the Blues and made appearances in all four of the preseason games and scored once, against PSG. Moses made his first competitive appearance since the return on 2 August against Arsenal for the Community Shield when he replaced John Terry in the 82th minute, the match ended with Chelsea losing 1–0. On 1 September 2015, Moses joined West Ham United on a season-long loan. Before joining West Ham United on loan, Moses signed a new four-year contract, which will keep him at Chelsea until 2019. Moses made his West Ham debut on 14 September in a 2-0 home win against Newcastle United. He was named Man of the match. In his second game, on 19 September 2015, away against Manchester City, Moses scored his first West Ham goal in a 2-1 win. Despite originally hailing from Nigeria, Moses initially chose to represent his adopted home of England, featuring for the under-16 team, in which he won the Victory Shield in 2005, and under-17 level. He travelled with the squad to the 2007 UEFA European U-17 Championship in Belgium, scoring three times (including the only goal in the semi-final win over France) to help John Peacock’s side to the competition final, where they were narrowly beaten by a single goal by Spain, though Moses managed to finish as the competition’s top scorer and collect the Golden Boot for doing so. That same summer the squad travelled to South Korea for the FIFA U-17 World Cup. Moses finished as the Young Lions’ top scorer, netting three times in the Group B fixtures, but sustained an injury in the victory over Brazil that ruled him out of the competition. Moses’ teammates went on to reach the quarterfinal stage. Following that tournament Moses was promoted to the under-18 squad, and following his goalscoring exploits for Palace’s first-team, he was promoted to the under-19 side without appearing sufficiently for the U-18s to actually collect a cap. He went with the U-19s to the 2008 UEFA European U-19 Championship in the Czech Republic, playing two matches and picking up one assist as the Young Lions failed to make it out of Group B. Speculation grew as Stuart Pearce snubbed him that Moses would return to play for Nigeria in the 2010 World Cup, this move never materialised. Moses was promoted to the under-21 squad at the beginning of the 2010-2011 Premier League season and made his debut against Uzbekistan in a 2–0 win. Moses was selected to play for Nigeria against Guatemala in February 2011, but the friendly was cancelled. He accepted a call-up in March 2011 for Nigeria’s games against Ethiopia and Kenya. However, he was ruled out of those games because his application to FIFA to switch nationalities was not received in time. It was announced on 1 November 2011, that FIFA had cleared Moses and Shola Ameobi to play for Nigeria. He was called up to Nigeria’s 23-man squad for the 2013 Africa Cup of Nations, scoring two penalties in their final group stage game against Ethiopia, which Nigeria needed to win to go through. For the second, the Ethiopian Goalkeeper Sisay Bancha was given his second booking in the events leading to the penalty and was sent off. Ethiopia had already used all three substitutes so their holding midfielder went in goal, and missed Moses’ penalty. The game ended 2–0. Nigeria went on to win the tournament, which was the third one in their history. Moses started in the final and played the entire game. Moses was selected for Nigeria’s squad for the 2014 FIFA World Cup and started in their opening group match and the Round of 16 match against France as they lost 2-0.